We have spent hundreds of nights tent camping on long treks and weekend hiking trips. On our various trips, we have forgotten some very key items. Ever try to light a camping stove without a lighter? How about realizing your hiking shoes are 200 miles away minutes before catching a ferry to a remote island for four days. Hiking 30 miles per day with flip-flops is not ideal. We’ve been there, don’t be like us! It is important to find ways to pack efficiently and light. Wearing a 30 kg backpack for 3 nights is not fun. Trust us on this one. Each trip can take a generous amount of time to prep and plan for. Our hiking & backpacking gear checklist will ease any pre-trip anxiety and make sure you have everything you need. We cover all the camping essentials you could imagine and don’t forget to check out our printable PDF checklist. 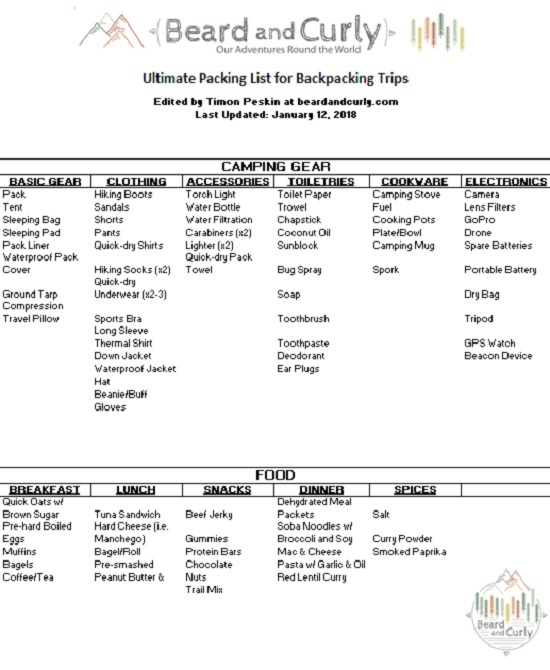 Want a printable packing list? Going for a long trip? 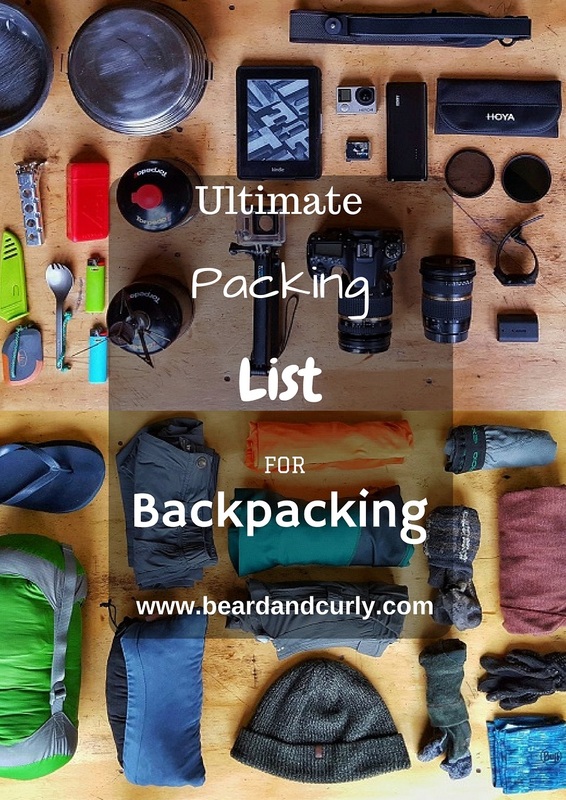 Check out our Ultimate Packing List for a Round the World Trip! Hiking for two or three days takes plenty of prep and planning involved, yet it is much easier to decide what to pack. There are necessities such as clothing, tent, mattress pad, and potentially a sleeping bag. There is greater flexibility with food and some camping luxuries. To pack lighter, bring food that requires no cooking, thus eliminating the need for a stove. This will save weight allowing you to bring some other goodies. Normally packing as light as possible is key, but on one or two night stays, we often bring our favorite “luxuries”: our Kindle paperwhite, a flask of wine and playing cards. Hiking for four to six days requires more planning and thoughtfulness on packing gear and food. Stick to the basics and leave everything else behind. 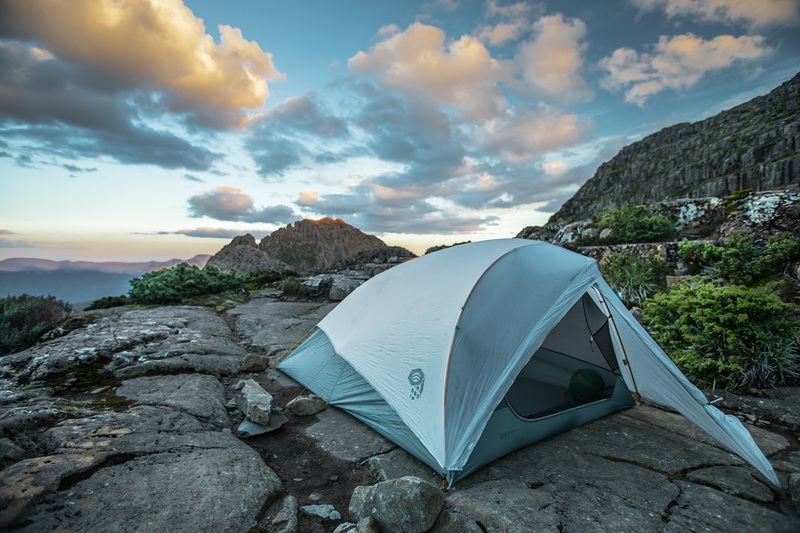 Good quality camping gear that is ultralight is good to invest in for longer hikes. Food planning is important to make sure you will not go hungry on the hike. Finding good lightweight options that are nourishing is key. Dehydrated meal packs are common, but are typically bland and expensive compared to creating homemade meals. Other great options include hearty but lightweight foods such as quick oats, noodles, lentils, and couscous. It is important to pack some “food luxuries” such as chocolate or your favorite candy. It is a nice reward at the end of each day. 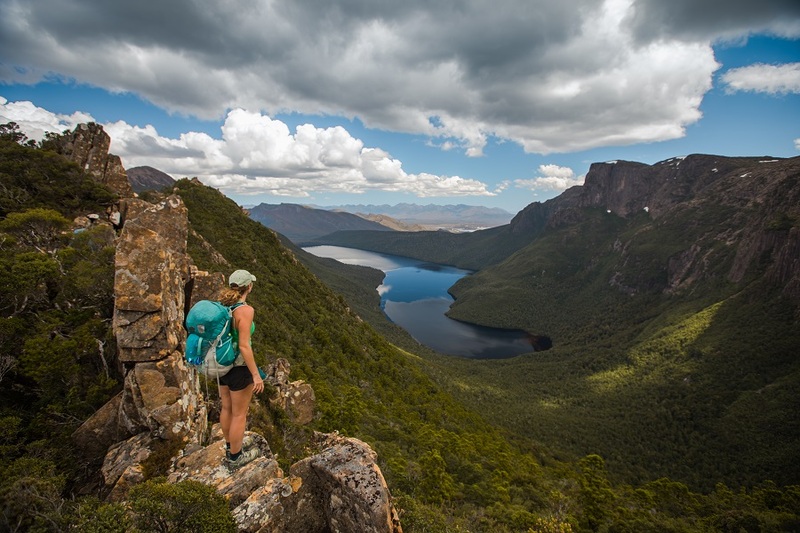 Six plus days of hiking enters a new realm of what to pack and how to pack it. Some through hikes in Europe or Nepal is great because of the ability to stay in a hut or tea house each night where food is provided. However, most hikes require everything to be carried on your back. Ultralight is key. We have found our greatest quantity of food to carry is ten days. Beyond that, it becomes too uncomfortable. Hiking longer than ten days requires even more preparation which typically includes food drops. Stick to the absolute minimal gear possible. Bring the same food as multi-day hikes, but with reduced quantities. A good option is instant noodles and soup packets for an extra one to two days of meals. It is safe to bring some extra food for emergencies or if bad weather arises. Leave all the luxuries behind, through hikes are all about getting into nature! We buy some of our gear from REI and B&H, but mostly through Amazon. As the largest online retailer in the world, they usually have the best prices as well as a 30-day return policy. If considering buying any camping, hiking or photography gear, we appreciate you purchasing through our below affiliate links. You won’t pay for anything extra at all and we will receive a small commission (usually 2%-5%). It helps support our travel and website costs. Thank you for the support! The three most important things for basic gear is the pack, sleeping bag and the tent. It is important to get a comfortable and reliable pack that fits properly, is lightweight and has good back support. Typically something between 50L and 65L pack size is ideal. Good brands such as Deuter, Gregory, and Osprey are worth investing in. Osprey is great for their lifetime warranty and comfort. Investing in a high-end sleeping bag goes a LONG way. Not only will it give more warmth through cold nights, but it will also be very light and compact. Go with a high fill down sleeping bag rated below freezing temps. Do not buy on looks alone. Make sure to properly lay down with the zipper fully closed to make sure the fit is right. Backpacking tents are known for their lightweight designs and in some cases extreme minimalism. In most cases the lighter the better. However, we almost divorced over a two-person ultralight backpacking tent. So if you are traveling with a loved one that you want to continue to love, a three-person tent may be a better option. Sleeping bag: These are the hardest to pick out. Our bags are the Rab Ascent 500 and Brooks Range Drift 15. The required clothing will likely depend on the hiking location and weather. 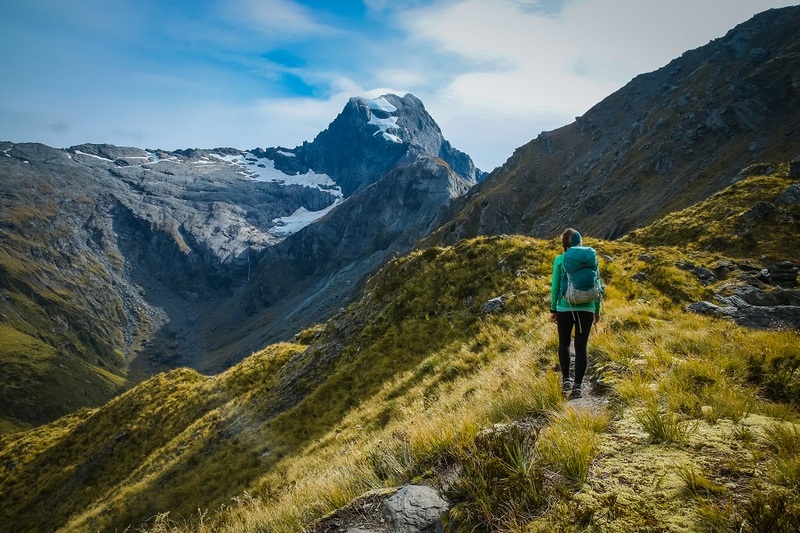 Hiking in warm weather can get away with fewer clothes and only need a couple of spare items. In high altitudes or hiking out of season, packing extra items is important. It is crucial to have one dry outfit reserved for evenings. At the end of the day, you want to be dry. A crucial thing about picking clothes is to pick quick-dry items. Avoid any cotton or thick clothing. The hardest thing to pick out is hiking boots. They come in all designs, from minimalist designs, trail runners, and massive boots. Boots typically take 6-10 hikes to break in, so early blisters and pain is normal. We like the ankle or mid-ankle design trail running shoes that are lightweight but still have excellent support. Salomon has top designs for support and comfort. A few accessories are needed, especially a torchlight and lighters. I always seem to break my torchlight, even higher-end models. Somehow our cheap Energizer has lasted the longest. Water filters may not be needed, so it is important to ask locals or a park office about the water quality beforehand. Typically at high altitudes, the water is fine, but it is better to be safe than sorry and pack a filter. Water filtration: The Platypus Gravity water filter is awesome. They have a 2.0 Liter Filter and a 4.0 Liter Filter. A UV Steri Pen or water purification tablets are other options that take up less space. Hikes typically do not have toilets, so make sure to bring toilet paper and a trowel. It is important to always dig a hole 6 inches deep and leave no trace. Please do not leave toilet paper on the ground, no one wants to see rubbish while enjoying nature. Even though it is biodegradable, it can take months in certain environments to decompose and it is not good for the animals. Try to use products that are better quality for the environment and our skin. Trowel: Get a lightweight one like this Grizzly Peak trowel. Cookware is essential for longer hikes and in the backcountry. There are different types of stoves and cooking methods and we have tried several options. The Jetboil and Pocket Rocket are quick and easy and great for short hikes. However, they are very wasteful and fuel is expensive. The fuel canisters are not reusable or recyclable and are difficult to determine the amount of fuel left in the can. The MSR Whisperlite takes a little more time to get going, but it is very fuel-efficient and the best stove for high altitudes. Electronics will differ drastically from person to person. If photography is not your thing a phone and possibly a beacon device will do. A personal beacon device can save your life in a bad situation. If going remote always carry one. For those interested in landscape photography, bringing camera gear is necessary. On long hikes and through hikes, we typically only bring our wide-angle lens. On shorter hikes, we bring all our lenses and our drone. This gear can get heavy so find the right balance for the length of the hike and gear required. Be sure to have a good dry bag, it can save expensive gear in wet conditions. Always bring a portable charger and spare batteries to last the entire hike. Filters: Always have a UV protection filter. A circular polarizer and neutral density filter can elevate your photography. Portable battery or solar charger: Anker 20,000 mAh Portable Charger and/or the Anker 21W Dual USB Charger. For the best solar chargers, check out this post. Yana is the ultimate backpacking chef. We usually bring some fresh items such as carrots or broccoli for the first few days of the hike. After trying many recipes throughout our days on the trail, we found a few winners that stick around. A few soy sauce packets and curry powder can go a long way. Also, peanut butter is my lifeline. 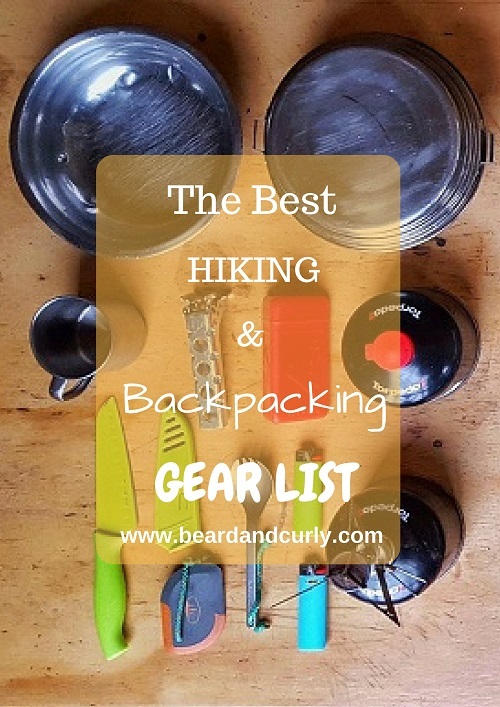 Now that you have all the hiking gear recommendations and packing tips, its time to stock up and plan your next camping adventure. Before leaving for the hike, always check the weather report to know the daily temperatures and rain forecast. It is a safe habit to bring extra food on longer hikes. We recommend to check in with a local park office to ask about the need for hiking permits as well as the current route conditions. They can help with planning what specific routes to take. Before leaving, it is good to tell a friend or family member of your intentions so that someone knows your plan and when you are expected back. Now that all the planning is over, pack your bags and head to the mountains! Don’t forget to hike responsibly and pack out what you bring in. Have a great hike! If you are hiking at home, you likely have insurance. However, if you are out hiking while on vacation or in another country, you likely will need travel insurance. The last thing you want is to get injured on your trip, and have it become a major headache and costly because you didn’t buy travel insurance. We highly recommend getting travel insurance so you are fully covered for your trip. World Nomads has some of the best international travel plans out there. Don’t get caught without it!